There are several verses in the scriptures that promise answered prayer. These are not unconditional, however. We must delight in the Lord, and then he’ll give us the desires of our heart (Psalm 37:4). Another references says that we must ask according to His will (1 John 5:14). That same author says a little before that we must ask and obey His commandments and do the things that please God (1 John 3:22). So we know that we don’t just get to demand our way and have the Great Vending Machine in the sky spit out our heart’s desire. 1 Samuel gives us another scenario: demanding our way when it’s not God’s way and God giving it to us anyway. What happens then and what can we do to avoid finding ourselves in this position? In 1 Samuel 8, we meet a great prophet, the namesake of this particular book, and he is getting old. He has a couple sons who should be the ones taking over the job of judging Israel, but they aren’t godly. They put personal gain first and pervert justice by taking bribes (v. 3). The elders of Israel, trying to avoid that problem, go to Samuel and ask him to anoint a king (v. 4-5). Samuel goes to the Lord with this request and the response is not promising. 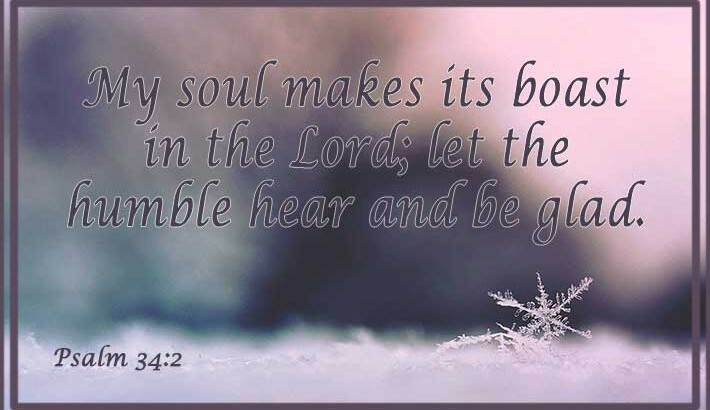 The Lord essentially tells Samuel not to take it personally; they’ve rejected God, not Samuel. In addition, if they ask for it give it to them (v. 7,9). Samuel goes back to the people and tries to warn them away from this course. He tells them all the troubles a king could bring, and all the things they’ll lose by being ruled by a man instead of God (vs. 10-18). This doesn’t sway the people, however. They want to be like the other “cool kids” of the time who have a king. 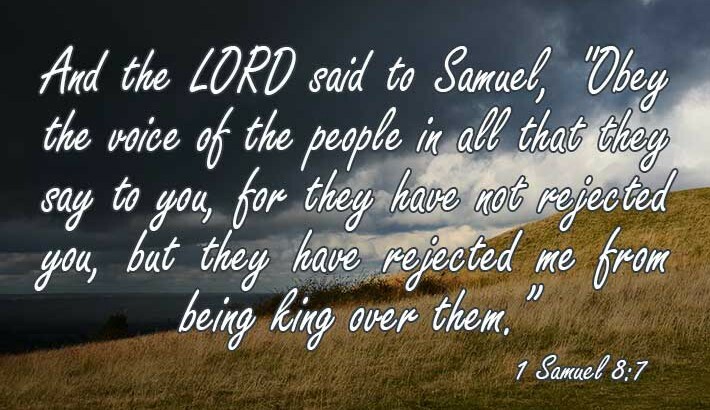 After double checking with the Lord and confirming the first response, Samuel agrees to find them a king. This scenario is useful for us to understand our own requests to God. In particular, request that are something we want, but that God says isn’t best for us. This passage tells us that the people are pulling away from God (v. 8). They don’t remember what God did for them and they don’t care. They want to have what they view as valuable: someone to rule over them and fight for them (v. 20). Never mind that God did that for them. They want a real flesh and blood person they can see. How many times do we do this in our lives? We say we believe the Lord, but when we can’t see Him moving or understand His plan, we doubt and try to find a solution we can touch and feel and understand. Willingness to trust Him comes at the cost of control. We want to know how things turn out and we want a guarantee that it will be pleasant as we go. However, God doesn’t give us those things. (In fact, there’s more promises of unpleasantness than not. 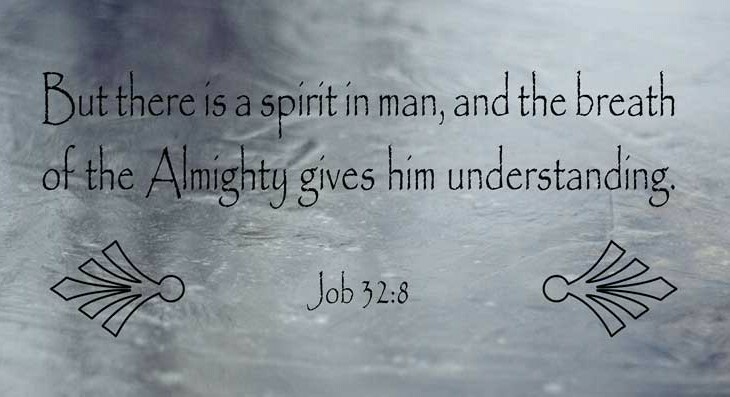 For example, John 16:33). When you are pulling away from God or when you’re feeling negativity, like fear or anger, stop and check what you’re asking God for. Why are you asking for it and are you willing to take no for an answer. God is making you in the image of Christ, but only if you’re willing. We must chose to commit our lives to the Lord and choose to accept His answers for us. If you’re not, you may get what you ask for anyway, to your detriment. Even though Israel demanded a king here and there were probably more bad kings than good ones, God still used the kings to bring about His plan. The first king Samuel appointed, Saul, ended up going a little crazy. The second king, David, brought about a time of prosperity that was only increased by his son, Solomon. The line is also the line that Jesus was descended through, as God promised David (1 Chronicles 17:11–14). God’s plan will be fulfilled and our sin or selfish requests won’t keep Him from His plan. However, God’s ways of doing things are always better and are always worth whatever we feel like we have to give up to follow Him. This is the message I needed to hear today. There are so many conflicting voices, most of the usually negative, in my head right now that it’s a good reminder to know who I need to turn to for truth and sustenance. In Isiah 55:2, the imagery makes even more of a statement when you think of it as an analogy with eating real food. 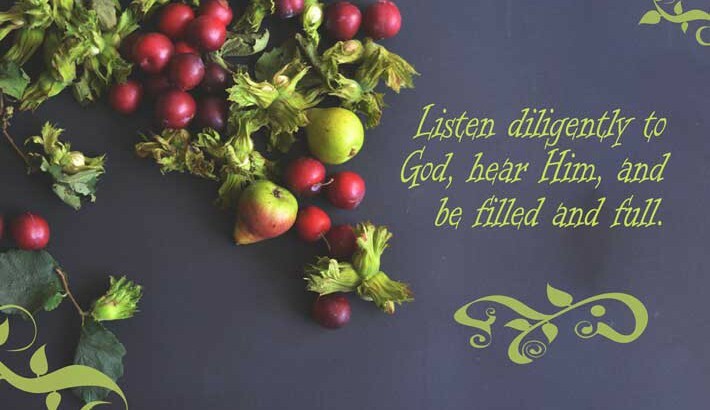 The statement “Listen diligently to me” is followed by, “and eat what is good.” Just by listening to the Lord’s words we are being fed. We can hear Him and be filled and full. But we also must choose to “eat” them; if the food is left on the table, it does our bodies no good. We must meditate on them, think on them (like we’d chew on food) and then we make it apart of us (swallowing it). The next part of it is “delight yourself in rich food.” This is a wonderful thought too, that when we are dining on the words of the Lord and being filled up with nourishment that is meaningful and lasting, it will be a joy. We will be able to find happiness in being near Him and listening to what He’s saying. “If our own doubts are not enough to stop us from getting up, then there will always be a multitude of other voices trying to keep us down. Unfortunately, it is often the voices of those who are closest to us that echo the loudest and to which we tend to listen most. I recently heard a bestselling author, Andy Andrews, telling about some advice that he was given, “Just because you think it doesn’t make it true.” This may seem simple on one hand, but it is very difficult in real life to implement that truth in a meaningful way. We often never question ourselves or what we’re thinking or why we’re doing something. If someone else is doing something that challenges our perspective in some way, we either dismiss them or get defensive. But, as Christine Caine points out in her devotional, “we must DETERMINE to listen to the voice of the Lord” (emphasis mine). We must be willing to get rid of the mental and spiritual food we’re chewing on that isn’t from the Lord and won’t satisfy. We must intentionally practice looking back and forth between our beliefs and our reality to make sure that they are in line. Do we believe something and do something else? Are we saying one thing and doing another? Only the power of the Lord and His words can bring us into alignment and let the truth come through us and into our choices.